Across the information technology world, cloud has become ubiquitous. Cloud computing has inspired many startups to adopt technology quickly and deliver services that would have taken months to develop and deliver in the traditional era. While companies ride that wave, many have come to the realization that not all workloads are cloud friendly. Data privacy, sensitivity of information, regulations and other factors are now pushing the industry to make a course correction in the “cloud-centric” roadmap that many companies pursued. IBM has always looked at hybrid cloud as the future. Not just because IBM has the end-to-end portfolio to help clients from the data center to public cloud (and anything as-a-service), but also because we see our clients and partners talking about hybrid cloud and asking for help with a strategy that accounts for workloads that need to stay on premises. As businesses move toward digital transformation (some are already in the process of completing it), there’s a strong need to leverage on-premises applications and data to make the transformation complete. IBM Systems has for a long time looked at private cloud as a building block for a strong cloud strategy and architecture. Having a strong private cloud architecture within your data center can give you confidence to take the next step, which is hybrid cloud. To help provide clients with a strong on-premises private cloud, in IBM Systems Lab Services we offer a Cloud Architecture Engagement. We arrive at the use cases that justify a client’s investment into private cloud—for example, workload provisioning, micro-services, DevOps and workload as a service (such as Hadoop or OpenDB). This use case–based approach ensures that our private cloud focus is not just on infrastructure but also includes the development-to-production lifecycle and gives clients the ability to implement application-centric private cloud services. 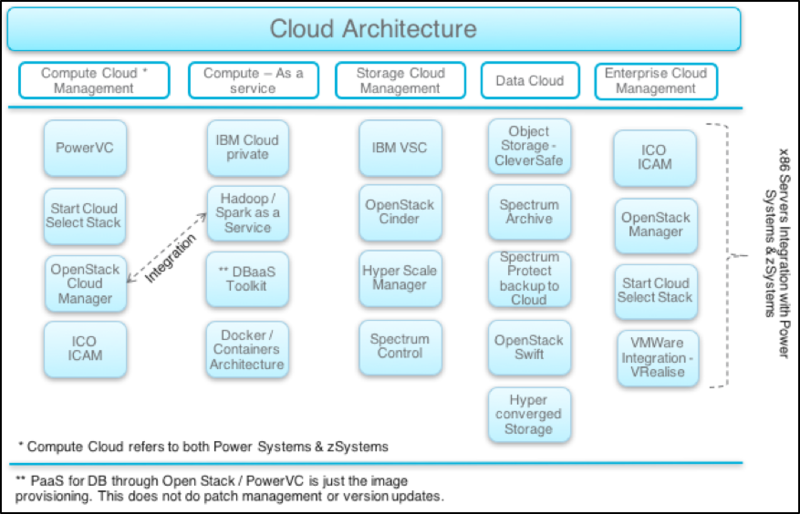 The approach to building a private cloud is represented as the Cloud Architecture Engagement building blocks in Figure 1. We help clients identify use cases that are suited for any of the above building blocks, and then help them build the architecture and deploy it. A use case–based approach helps organizations justify the investment. The use cases are tied to improving efficiency, bringing in newer technologies or addressing pain points that exist today. It offers a view of technology and products that helps the client achieve a strong private cloud architecture. For many clients, an end-to-end cloud architecture is a vision, and this approach helps them get started on that journey quickly. IBM software-defined storage technology can also help organizations with creating a hybrid cloud for data, which is a niche segment today. Especially with regulatory requirements pushing for retention of data for longer periods, having a hybrid cloud just for data helps you manage those expectations. For example, the newly launched IBM Cloud Private, built on Kubernetes, creates a container cloud environment. This gives you the ability to containerize applications and build a micro-service architecture that helps achieve an “as-a-service” journey within the data center. When this is coupled with other services like Bluemix API Connect and Secure Gateway capabilities or cloud brokerage services, hybrid cloud becomes a reality. Using IBM Cloud Private, you can also deploy a PowerAI-based machine learning and deep learning cloud within the data center and expedite the roadmap for insights-driven architecture. The cloud journey is here to stay. It is the way forward to bring businesses closer to their customers. By adopting a cloud architecture that is flexible and can propel you to a hybrid cloud environment, you can truly realize the power of cloud. IBM Systems Lab Services offers a wide range of cloud computing services. If you’re interested in talking to Lab Services about your cloud architecture, contact us today.